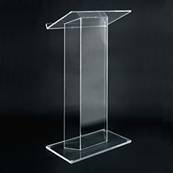 Clear Plexiglass Lectern - This plexiglass lectern makes a perfect church or meeting room display lectern. 26 3/4'X 15 1/4" The base is 26.75"X14.75"
· lectern amplifier are designed for speech, teaching and meeting. They are built-in 3 wide band speakers, RMS 40W amplifier, gooseneck microphone and VHF/ UHF wireless microphones for convenient applications. In addition, they also have XLR microphone input, AUX input for radio/ tape/ CD player or other audio signal sources, 6.3?REC output and line out jack which is easy to connect to mini broadcast system. 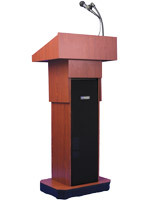 An adjustable podium is an easy way to accommodate speakers of any height. These lecterns are easy to adjust anywhere between 42 and 54 inches in overall height. No bending over to loosen a screw, just a simple press of the peddle raises the reading shelf. The finish panels snap in between the aluminum verticals without the use of tools. Stylish Sipping Seattle Java Speakers Lecterns- A great looking addition to any conference room, lecture hall or meeting place. · Standing 12.5" tall this lectern bring reading material and notes closer to the speaker making it easy to give that big presentation. The top shelf measures 14"w x 12"d and has a 1/2" lip at the bottom so your materials don't slid off. 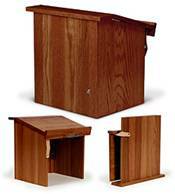 When setup this portable solid wood tabletop lectern measures 14"w x 12.5"h x 13"d. A metal snap that is used to keep the folded lectern closed is visible on the lower right corner of the front of the unit. 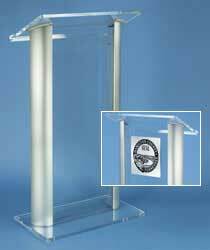 · Clear Acrylic Table Top Podium Stand for desktops and tables. This acrylic table top podium stands 18 3/4" high and the reading platform measures 26 3/4"w x 14 3/4"d. Made from 3/8" acrylic this table top podium stand is great for churches, libraries and conference rooms.